Above, my husband enjoys double the amount he should be eating! Tammy's Recipes is a talented, one-woman test kitchen. She tried doubling the no-Bisquick cobbler recipe I posted earlier this summer. Folks, I'm so embarassed! Tammy's cobbler didn't cobble, if one could say that of half-burnt, half-baked result. 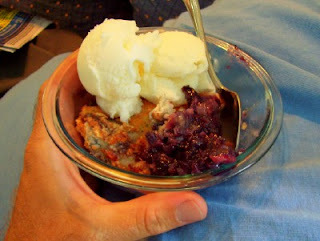 I test-doubled a blueberry cobbler to check the recipe, using a 10.5 x 16 inch pan. 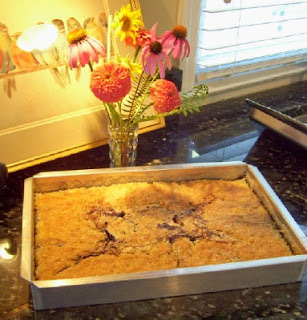 Cobbler-times-two is best in a shallow pan. Even though the doubled volume may be the same, the batter needs enough surface area to rise through the fruit. Err on the side of a larger but thinner cobbler if you need more than an 8 x 10 pan. Consider baking two 8 x 10 pans full! Make sure you double all the ingredients--especially the baking powder. 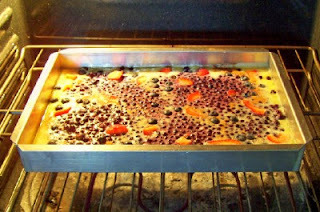 Frozen fruit may add too much liquid to the batter for proper rising. This recipe's taste depends solely on the quality of your fruit. That's about half of what I would be eating. I doubled the recipe, and used frozen fruit last weekend and it was a beautiful confection that was rapidly consumed by all and there was none left. I omly used one stick of butter though and it worked out fine. It's officially one of my favorite recipes now, even if it does use all thaty sugar. I have made it 4 times since you posted the recipe, and everyone loves it, expecially when I used rhubarb! In fact, I tripled the recipe for our annual township picnic (and baked in an 11x15 pan) and it was a huge hit! Looks good! I finally made your OTHER cobbler the other night! It was a HUGE hit! Gone in a day! I doubled it with canned peaches in a 9 by 11 pan and it was great! I only included half of the fruit juice. Maybe something is off with her oven? I prepared a double recipe in a 9x13 pan for the 4th of July with several cups of blueberries and a couple of chopped peaches as the fruit. It was quite the hit, especially served warm with ice cream! Yum-yum!! I also doubled the recipe, and while it did overflow, I had put a baking sheet under my pan. By the way, I used strawberries, and everyone loved it.